Each year, Grand Teton National Park collects comprehensive data on the number of wildlife-vehicle collisions occurring on park roads. This information is used to examine trends and patterns in an effort to make park roads safer for both humans and wildlife. Four years ago, Grand Teton initiated a proactive education/ prevention campaign to reduce the apparent growing number of collisions and associated animal mortalities. Despite a determined effort to educate and alert motorists about wildlife on roads, the number of these incidents appears to be fairly consistent from year to year. In fact, park officials believe that the tally is likely higher than the numbers indicate, because some collisions are not reported, particularly when smaller animals are involved. Wildlife-vehicle collision statistics for the past five years reveal that an average of 33 deer, 38 elk, ten bison, seven moose, three pronghorn, two bears and one wolf are killed each year on park roads. 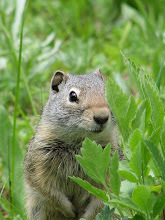 In addition, a host of smaller animals such as foxes, porcupines, beavers, marmots, pine martens, sage grouse, and owls die each year as a result of collisions with automobiles. The data suggests that vehicle speed, time of day (e.g. dusk, dawn, and nighttime), and specific location (e.g. 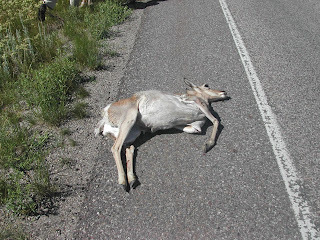 the Gros Ventre junction and adjacent area) may be factors in wildlife-vehicle incidents. In 2006, Grand Teton National Park and the Jackson Hole Wildlife Foundation entered into a cooperative agreement to address wildlife-vehicle collisions, and implement a variety of educational outreach and mitigation measures. One of the steps taken was the placement of flashing message boards at strategic locations along Highway 26/89/191; these variable message signs caution motorists to be alert for wildlife and to slow down. In addition to the flashing message boards, other efforts include stationary signs placed at wildlife crossing hotspots, public service announcements broadcast on the radio, flyers provided at park entrance stations, and cautionary alerts placed in the Teewinot, the park’s newspaper. Grand Teton is also working with the Wyoming Department of Transportation on developing additional mitigation measures. In an ongoing effort to reduce wildlife mortalities related to vehicle collisions, Grand Teton park managers once again urge motorists (local residents and out-of-state visitors alike) to stay alert, to slow down and to give wildlife a brake—especially during low-light conditions from dusk to dawn when animals may be difficult to see on roadways. 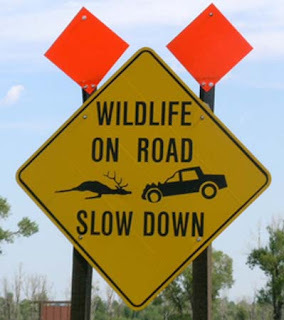 Drivers should expect the unexpected with regard to wildlife that travel near and across park roads.